Greetings, and welcome to FinovateEurope! It’s really exciting to be kicking of our 2019 event series, and we’ve got a great few days ahead of us. We’ll see demos from some of the most cutting-edge innovators in fintech, and we’ll also hear from some of the executives, thought-leaders, and analysts who are driving fintech forward. The next few days are relatively predictable (there’s a clear agenda with clearly defined Places To Be and Things To Do), but it’s already becoming clear that 2019 will be anything but ordinary. Uncertainty surrounds the world of finance, with serious questions still to be answered in the UK, EU, and the rest of the world. Nobody knows what to expect, and that uncertainty can be daunting. But while the shifting landscape will undoubtedly create many pain points, it will also create a host of new opportunities for innovators to take advantage of. New problems need new solutions, and for those that can provide those solutions well, those initial frustrations could very well turn into a blessing. 2018 saw huge advancements in fintech’s technical capabilities. Tools like artificial intelligence (AI) and blockchain technology are easier to implement and more widely understood than they ever have been before. The next step is going to be taking those tools and pointing them towards the areas where they have the potential to make a big impact. To me, this is the biggest challenge for fintech in 2019, and I’m fascinated to see how the industry copes with the ever-shifting landscape. In the meantime, I sincerely hope you enjoy the relative predictability of the next few days, and I’m confident that you’ll leave with tools and insights that can help make your 2019 more productive and enjoyable. Thanks for joining us, and as always, keep innovating! 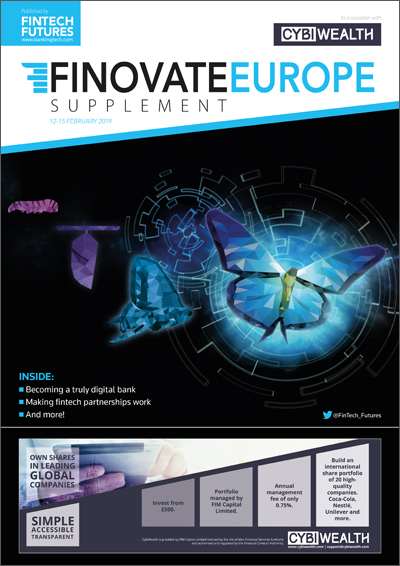 Click here to access the FinovateEurope 2019 Supplement online – it is free and no registration required. Just click and read! Or pick up a complimentary print copy at the event (12-15 February 2019, Tobacco Dock London). The biggest downfall of a shared language these days is in your office. The US, in particular, is in urgent need of new core offerings to support next generation digital banking. Congratulations to the trio of winners! Our job is to persuade organisations to let go of their old bicycle. Introducing Extrapreneurship, a new programme helping employees of large FIs to adopt the entrepreneurship mindset. How can banks factor in extreme climate events and environmental disasters risks to improve their credit risk ratings? Your gut points you a certain way; your heart decides; then your head wraps some logic around it.